Hardware:Core i5 7400 3GHz, NVIDA GeForce GTX1070, 8Go ram. 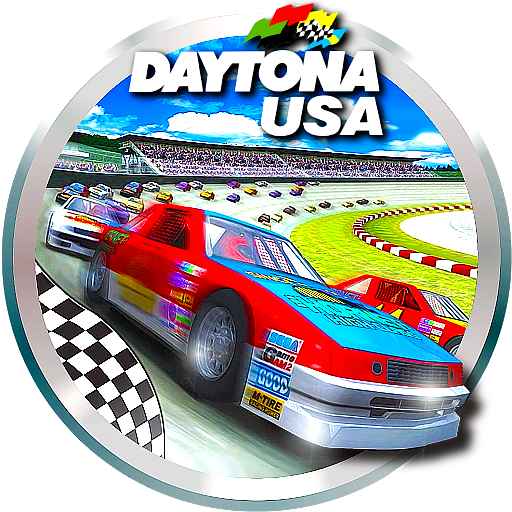 Daytona USA, 1994-2019: The king of arcade racing is 25 years old! This is a HD texture pack for use with Elsemi's MODEL 2 emulator. A readme file is included. ... Sega Racing Classic... no sorry ! This has been only possible for me with model 2 emu (it gives the ablility to extract & replace a texture of your choice). This emulator still rocks nowadays. Looks great Steff, hope you can release it soon!!! I'm far from being a graphic artist but I'm putting together a driving cabinet for a friend of mine and would love to make one of the advertising signs contain his company logo. Is there a short tutorial on how to start this? Thanks for the kind words on the "screenshot site" !! 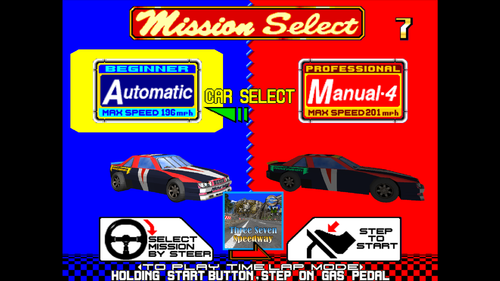 - When you reach the texture, go to the Model2Emu's menu on top of the game, select "Game", then clic on "Dump texture cache"
In this case you find two textures because the Daytona Engine (or Model 2 ?) can't give more than one colour to a texture, so one texture will be colored in red, the other one in yellow. - Now you can replace the SAO PAULO texture by a picture of your choice, respect as much as possible the original ratio (64x256 pixels can be replaced by a picture sized 128x512 pixels for example), use PNG format ! ! In this particular case, the "Yellow" picture will be above the "Red" one, so replacing the 8166019_E487A537 picture will matter, the other one can be replaced by a small blank or transparent picture. 8166019 E487A537 : the name of the original texture given by the dump, without the "_"
myreplacedtexture.png : your PNG file, give it the name you want. - Place your replacement PNG and your .pat file in the "script" folder. mode_1.ps is an example of linear lighting (the way 1.0 version colored this textures). mode_2.ps is an example of lighting through the luminance conversion table specified in the game (see the shader comments). Filename is the name of the file to use as texture (.png). Alpha transparency is supported for Colored textures. ID pair, first dump the texture cache from a running game using the Game menu option "Dump texture cache". that way you can get the IDs and the corresponding texture as base for replacement. The .pat files are read on game load, so you need to re-load a game to see the new textures. Nothing wrong with being a perfectionist my friend. I wouldn't want to release anything until I was 100% happy with it either. - The animated people (seen in the pit in "Beginner" circuit or on the bridge in "Advance" circuit, too fluorescent). - The fir trees in the Beginner circuit . Video added in the 1st post. 1st post edited with the download links ! I'm far from being a graphic artist but I'm putting together a driving cabinet for a friend of mine and would love to make one of the advertising signs contain his company logo. Have you been successful with your texture replacement ? In order to celebrate this, I offer all fans (& myself) a high definition texture pack for use with Elsemi's MODEL 2 emulator. I hope you will like the result as much as I liked to do it !! Is this because of my bad english ? A few fans have requested the Casino elements in the Beginner course, I don't really know why I changed them (I love SegaSaturn). 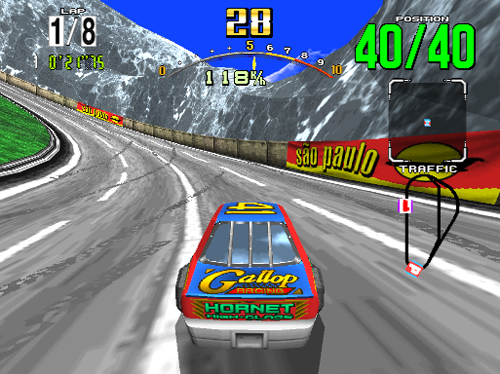 I'll still apply the SegaSaturn & Rubik's Cube textures on the "Daytona USA Saturn Adds" rom. 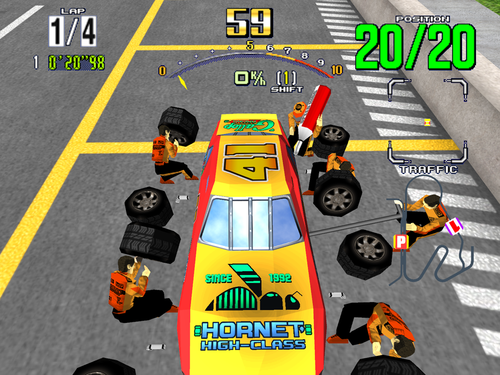 New (big) fans request : Redo the textures for the Hornet Car (Hornet + Bee + Gallop Racing) to allow the Model 2 to colorize them itself. In link mode all those colors change again depending on the driven car. 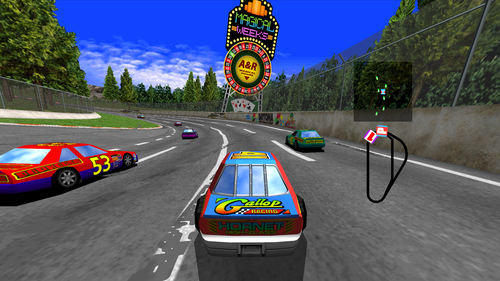 Lots of details in the work to recreate the full Daytona USA experience in HD, based on Daytona fans' requests. I feel like a slave for this project lol. I didn't expect so much interest. Feel free to comment or request here too, I'm listening to everyone to try to make the best graphic patch ! Salut, tu as pas refait de nouveaux pas encore, je vois que tu as éditer ton post 1 mais les packs sont encore de février? Oui ! j'ai juste viré des photos du 1er post pour pouvoir glisser la dernière (j'ai un espace limité sur le forum pour mes média) . Quand je ferai une mise à jour des packs je ferai un renvoi au 1er post avec annonce claire ! L'update va venir bientôt, j'ai refait 50 textures, encore quelques-unes pour renforcer la fidélité avec les graphismes originaux. Thanks a lot srietscha ! but the best is to come as it's still a W.I.P. Now everything about the Hornet car is done with full respect !!! to prevent from having a RED front car for every player in a multiplayer race (LINK). The Model 2 will color the texture (Blue, Green, Yellow, Pink...), depending on the car you drive. Can I replace that with "19104011 DEBDE4F2 0 Car_front_Link.png"? Actually, I haven't played this game in Link Mode, so I don't really understand what this issue is. If you don't mind, could you show it by means of a picture or a video? Hi scju, yes just do what you've written ! I wrote the readme file just before I reorganized my shaders. 5 is the good value, not 8. Hello, stf999, thank you for your kind reply. I'm looking forward to the final release. Someone need to send me the missing blue and red textures please. The red & blue are not textures, only colored polygons. In my pat file you'll find 1A9A4000 6C5E674 0 Car_Reflect.png, it's the shadow applied on the blue (or yellow) color. If you edit this "car_reflect.png" texture and paint it with the color of your choice, and then write 1A9A4000 6C5E674 5 Car_Reflect.png in the pat file (5th shader instead of 0), you will colorize the blue part of the car. Yeah i speak with you in a nother website in private. Thanks! I still can´t paint that red thing and the blue wing, i wish was able to make a Michell Vaillant Car just for fun. Try TexMod maybe will work. Sorry I won't have time for this. At the moment my personnal goal is to redo what was too "personnal" to get a 100% respectful set of textures (hmm 95% lol).